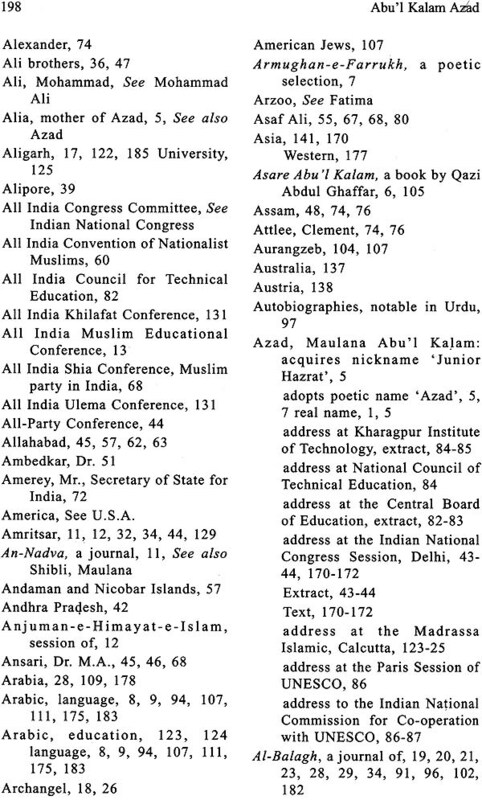 The book presents the life history of Maulana Abu'l Kalam Azad, who has been written upon extensively, yet scattered. An attempt has been made to bring together the stray strands, objectively. Unconventional and a firm believer in carving out his own course, he lit many a lamp to dispel gloom and ignorance. Maulana was a man of great learning, who had mastered the old classics and yet was blessed with modern scientific temper. This 'Imam-ul-Hind' was worthy of leading the entire humanity. 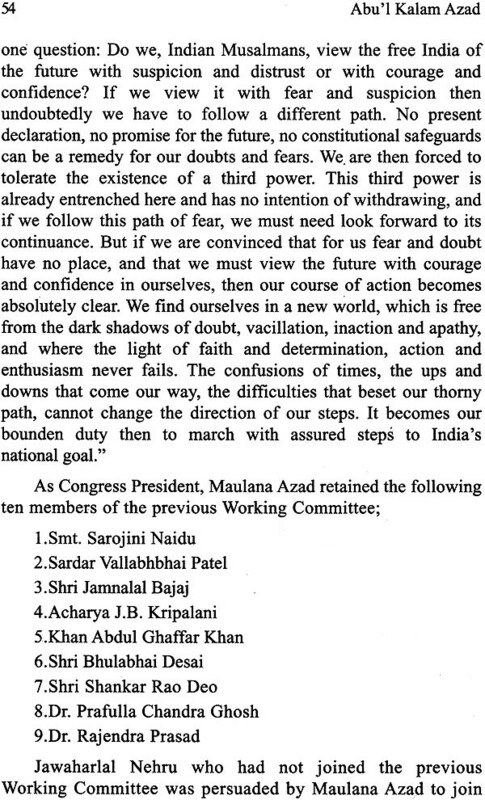 It is not easy to present the life-history of Maulana Abu'l Kalam Azad in correct perspective. Himself s prolific writer, Azad has been written upon extensively, both in India and abroad. Also, sometimes facts have been distorted or fiction interwoven into facts. 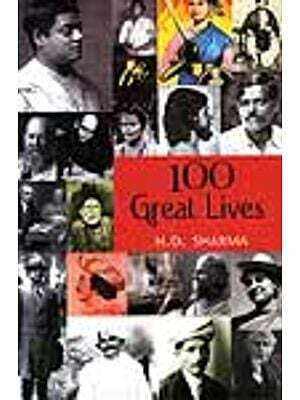 To chronicle the biography of this great man objectively, from the plethora of material, was indeed a challenging task. 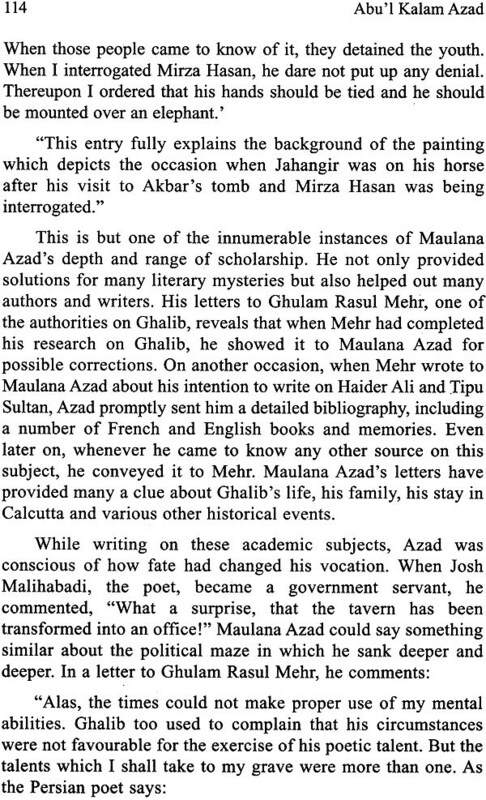 It was rewarding too, for I always found something thrilling in the rich and varied life of Azad. My endeavour in this volume has been to bring together the stray strands and, to the best of my ability, I have tried to be objective. While a bibliography has been given at the end, I deem it my duty to acknowledge my gratitude to those from whom I have benefited most, particularly K.G. Saiyidain and Malik Ram whose writings I have freely quoted or referred to. 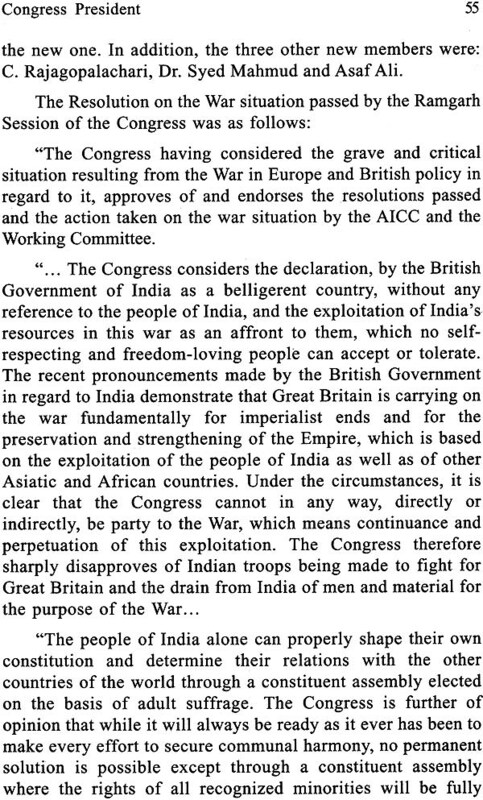 Other notable references: "India Wins Freedom" by Maulana Azad; "Anwar-e-Abu'l Kalam "-- collection of papers edited by A.J. Zaidi and presented at a seminar in Srinagar; "Zikr-e-Azad" by Maulana Abdur Razzak Malihabadi; "Aasar-e-Abu 'I Kalam" by Kazi Abdul Ghaffar; and "Indian Muslims through the Ages" by Dr. Abid Husain. These books were of immense help to me and it would be most ungracious on my part not to acknowledge this. 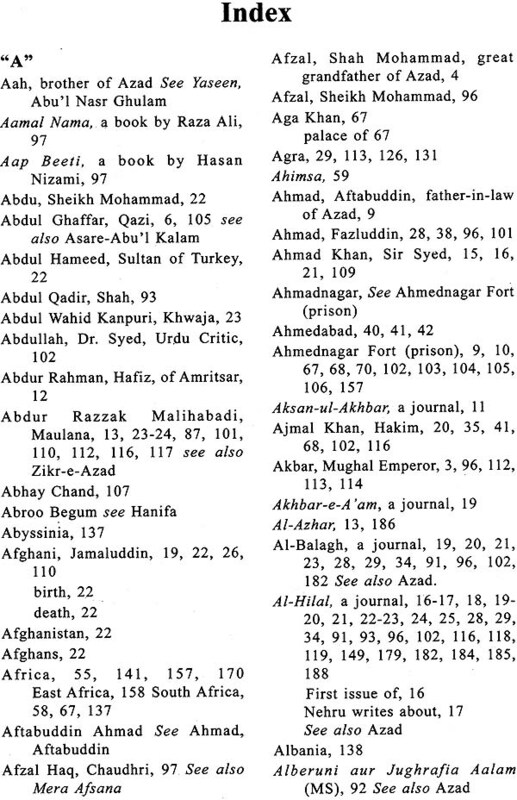 Maulana Azad's own writings and publications and the relevant literature published by the Publications Division have been listed in the bibliography. 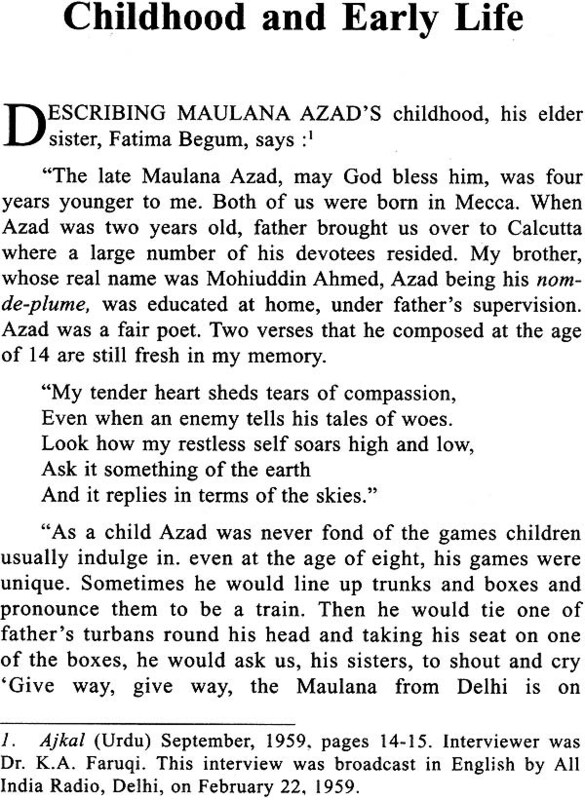 When Maulana Azad's mortal remains were being carried in a procession through the streets of Delhi, the assemblage, which included the present writer, was a vast humanity. Young and old, rich and poor, men and women and children had foregathered in thousands to pay homage to a universally respected leader. It was remarkable that there were few eyes which were not wet in the memory of one who preferred, particularly during the last few years, to live in comparative seclusion, away from the hurly burly of public life. Was this withdrawal from the public gaze, one wonders, prompted by a premonition that he was soon going to attain eternal loneliness? He lies buried in an elegant park near lama Masjid, but again one wonders whether he himself would have chosen this locality where tombs have a way of being converted into public shrines. 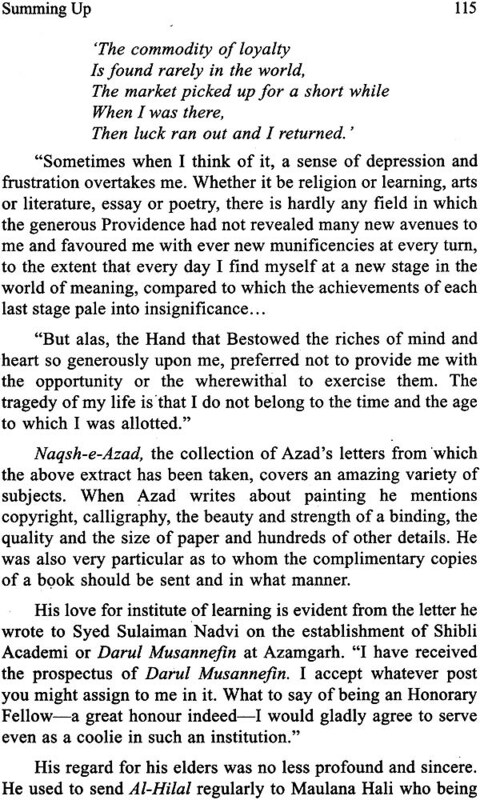 For Azad, the rebel, abhorred the adoration of shrines. 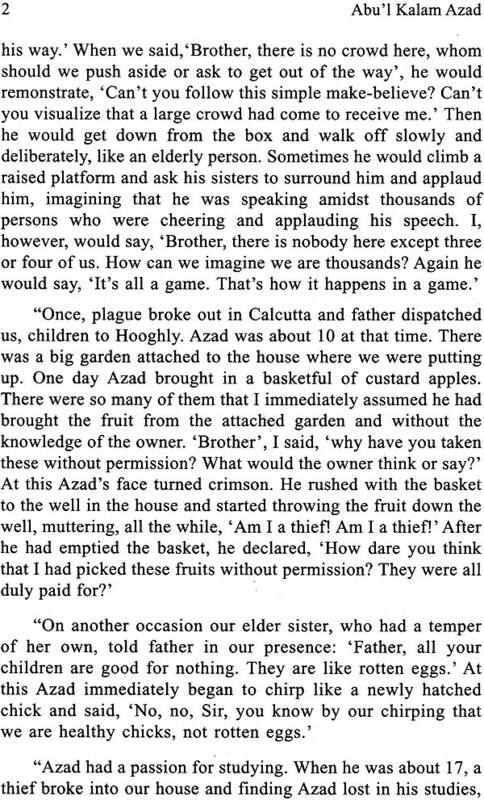 The greatest deterrent to man's mental progress, declared Azad, were his traditional beliefs. He himself was unconventional and firmly believed in carving out his own course, whether in politics or in social customs and practices. Thus while he showed us many new ways and lit many a lamp to dispel our gloom and ignorance, it is entirely up to us to follow him according to our own lights. That he was a man of great learning, a peerless mixture of the present and the past, one who had mastered the old classics and yet was blessed with the modern scientific temper, need no corroboration. Comparisons are odious and, in this case, we are not even qualified to make any. 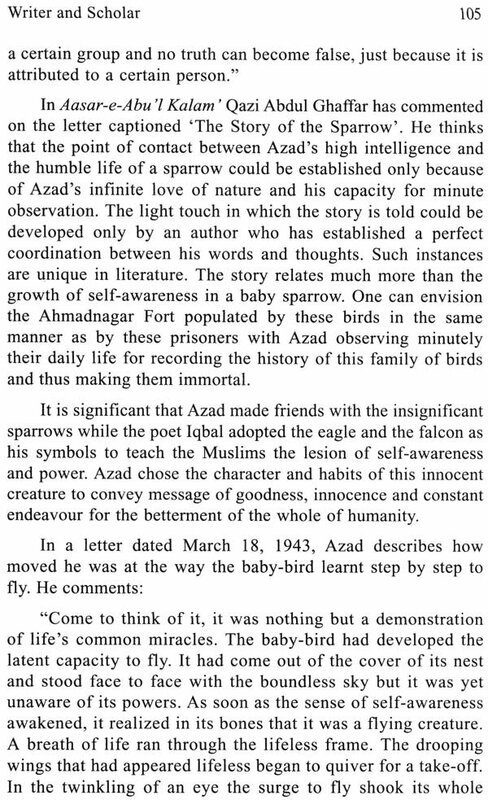 Even so, the present writer would venture to say that while Azad was proclaimed as Imam-ul-Hind (the leader of India), it would be nearer the truth to say that he was worthy of leading the whole of humanity. (There are thousands of tasks involved in this business of love. It was I, not love, that gave up so soon). Orient Black swan Pvt. Ltd.